MURMANSK – Sayda Bay, a naval area on the Kola Peninsula in Russia’s Far North – a former fishing village serving as a long-term storage site for the hulls and reactor compartments of decommissioned nuclear submarines – long remained one of the world’s worst radiation hazards. This all changed when the international community decided to do something about it – and when, in 2003, German technologies and funding came to Sayda Bay. In 1990, Russia first started to decommission its old nuclear-powered submarines – and Sayda Bay, a locality in Kola Bay, in the northern parts of the Kola Peninsula, and not far from the shiprepairing yard Nerpa, which services the nuclear-powered ships of the Russian Northern Fleet – became the first place to accommodate the reactor compartments of the cut-up vessels. These sections were hauled to Sayda Bay by tugboats from shipyards in Severodvinsk and other towns where the aged Soviet nuclear ships where being dismantled using funds dispensed via the Nunn-Lugar program (also called Cooperative Threat Reduction program, CTR). Named so for former US Senators Sam Nunn and Richard Lugar, who developed the program in 1992, the initiative has since its inception helped Russia destroy and safely store scores of nuclear, biological and chemical weapons inherited after the collapse of the Soviet Union. The number of reactor compartments stored afloat, tethered to the pontoon piers, in Sayda Bay kept increasing year on year. 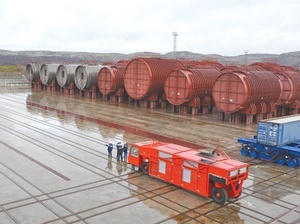 By 2003, there had been some fifty reactor compartments moored in storage at the site. The initial plan was to keep this extremely dangerous Cold War legacy in the bay for a period of no more than ten years and then move it into safe and reliable storage facilities – sites that were slated to have been built in the meantime. But twelve years later, construction had still not started, and the cut-up sections were still bobbing at the piers in Sayda Bay. In fact, no storage facilities or special sites capable of safely accommodating the old reactor compartments were found either in Russia’s North or in the Far East – areas where the nuclear-powered submarines of Russia’s Northern and Pacific Fleets are stationed. This problem is something Bellona has written about extensively in its news coverage and spoken about at numerous international events focused on the issues of nuclear and radiation safety. In October 2003, however, an agreement was signed between what was then Germany’s Federal Ministry for Economics and Labor and Russia’s Ministry of Atomic Energy, the latter subsequently restructured into what has now become the State Atomic Energy Corporation Rosatom. The agreement envisioned building an onshore storage facility for reactor compartments of dismantled nuclear submarines. The construction of the new facility – a project financed by the German government – started in Sayda Bay in 2004. German companies were also developing the needed technology and directly participating in building all the infrastructure for the storage site. The Germans’ experience and technology were used to create a unique transportation system for the 40-ton reactor compartments of old dismantled submarines. In 2005, work started to prepare the site for construction of a reinforced concrete slab that would serve as the future storage yard. Altogether, some 300,000 cubic meters of soil was removed, and some 200,000 cubic meters of rock blasted and cleared from the site; on the whole, over 1 million cubic meters of material was moved. Dredging work was done as well in preparation for accommodating the floating dock that would carry newly cut-out reactor compartments arriving in Sayda Bay. As of today, around EUR 700 million has been spent on the project. 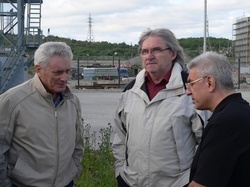 Late last June, Rosatom’s Public Council arranged a tour of the onshore storage facility in Sayda Bay for members of the press and NGO representatives. 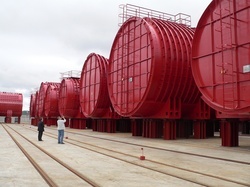 Fifty-four reactor compartments from decommissioned nuclear submarines are stored and serviced on the land-based portions of Sayda Bay, while another 32 three-compartment blocks (including the reactor compartments) remain afloat at piers awaiting land-based handling. Words fail to describe the impression one now gets from Sayda Bay – an area that ten years ago offered nothing to the eye but a handful of decrepit shacks of the former fishing village. One wouldn’t have believed the changes if one didn’t see them for oneself. What was just wasteland and swamps less than ten years ago has today become the country’s most state-of-the-art facility for storing reactor compartments of Russia’s decommissioned submarines. The roads – indeed, everything the eye observes – speak of the craftsmanship and orderliness German engineering is renowned for. The onshore storage facility’s director, Vazgen Ambartsumian, proudly showed the visitors the concrete roads that revealed not a single dent, not even an oil stain. Smoking is strictly forbidden on the territory, and every worker is personally responsible for the area they are in charge with. Discipline, meticulousness, and punctuality are the work requirements set by the German partners. And as Ambartsumian takes the visitors on a tour of his site, one understands that successful projects such as this are not just born out of German funding and German experience – but the passion of those on site doing their best to make sure, day by day, that the difficult and important goal is being accomplished and what seemed at first like an impossible task is being fulfilled. 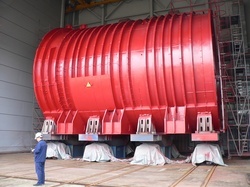 Every ten years, a submarine reactor compartment held in storage in Sayda Bay will be transported into the workshop to have its coating renovated and radiation condition inspected. 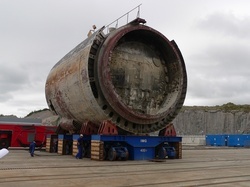 The compartments will remain in storage for 70 years, after which the next generations will have the task of researching further solutions for managing Russia’s nuclear legacy. It seems unbelievable that such a modern facility would be built in the harsh Arctic conditions in such a short time. In 1995, when Bellona first started pressing for solutions to the nuclear and radiation challenges that had built up in Russia’s north, we dared not even dream of such sweeping changes. At the time, the goal was to secure a minimal level of radiation and nuclear safety to keep these risks at bay. Today, one can state freely that as far as handling the decommissioned submarines’ reactors goes, the improvements achieved surpass Bellona’s wildest expectations. Not much is left to do in the Russian part of the Barents Sea, where grave nuclear and radiation hazards accumulated over the Cold War years – problems that were then left unattended in the subsequent years as Russia struggled through its transition from a Soviet state into a new democracy. What remains on this to-do list is safeguarding the naval radioactive waste and spent nuclear fuel storage facilities in Andreyeva Bay and Gremikha; and scrapping the nuclear maintenance vessel Lepse – the world’s most dangerous floating radiation hazard, which, after many years of refueling Russia’s nuclear fleet and hauling the vessels’ waste, and then decades of moorage at the port of Murmansk, was, thankfully, finally towed to the shipyard Nerpa last September, but found itself “stuck” there waiting for the single dismantlement spot to free up. 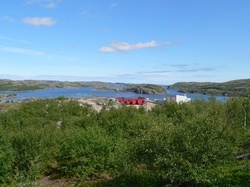 When these tasks are accomplished, remediation efforts in the Barents region can be said to have succeeded at last.